L’acqua di Fiori has chosen DuPont’s Surlyn resin for its new collection, the Cupcake Me line for “tween” consumers (girls aged 8-12 years) in Brazil. The packaging creation was planned by L’acqua de Fiori marketing team and Abner Brito, the company’s designer. To stick to the traditional American cupcake image, the designer has chosen a standard glass bottle decorated with two eethylene vinyl acetate (EVA) layers and closed by a red cherry-shaped perfume cap. “During the packing planning of the new line, the main L’acqua de Fiori concern was maintaining the toughness and safety, without losing the product’s charm and attractiveness for this age group that is so demanding and linked to the new trends,” said Célia Anrelink, L’acqua di Fiori Product Manager. The red cherry-shaped cap creation has used DuPont Surlyn, a resin that has several applications in the cosmetic industry, primarily in caps for perfumes or pots. The resin was suitable for the composition of the rounded-shaped caps symbolizing the cherry since the brand’s main purpose is adherence to the fragrance and the original cupcake packaging, according to DuPont. “The material was chosen by L’acqua di Fiori packing development team because of the brightness, charm, toughness and safety requirements in the initial packaging planning,” explained Janine Carvalho, Sales Representative of Polymers for Packaging and Consumer Products division at DuPont Brazil. 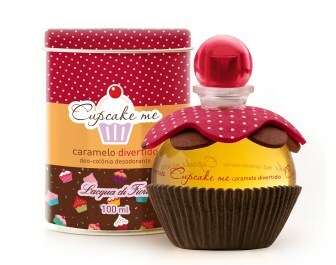 The Cupcake Me line represents the sweet side of life and has two fragrances inspired by the American cupcake: Napolitano Chic and Caramelo Divertido.